Text message scheduling is a useful feature that I’m surprised Apple hasn’t already built into iOS’ Messages app as a stock feature. After all, sometimes you want to wish someone a Happy Birthday or wish them a great holiday and you may remember before the fact, but you forget when the time actually comes. Kairos is a new jailbreak tweak that streamlines scheduling out text messages in iOS, and we’ll show you how it works in this review. 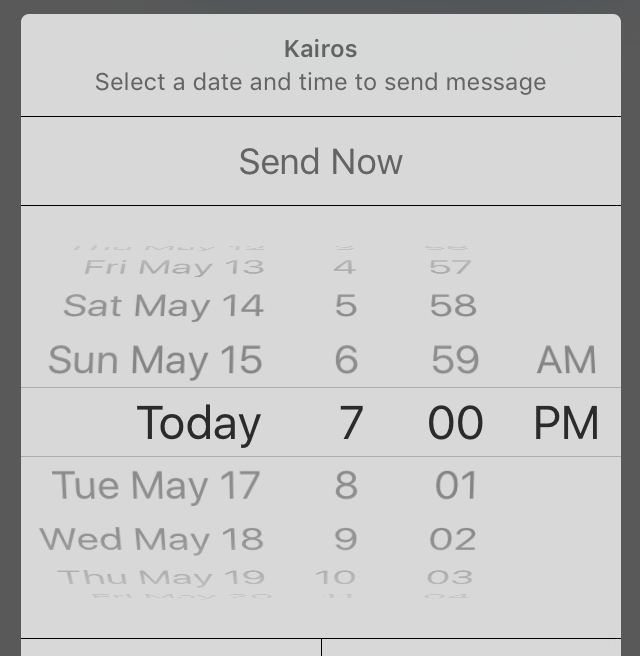 Since there is no text message scheduling feature built into a stock installation of iOS, jailbreaking your device and installing Kairos is a great way to get the feature so you can make sure your important messages always get to people on time. When you do, you’ll notice two options that are reminiscent of biteSMS: schedule and switch service. For the record, the switch service button lets you choose between sending the message as an iMessage or an SMS message, but the schedule button is the one we’re going to be focusing on in this review. When you tap on it, you’ll get a date and time combo box that asks you to select a date and time to send the message you are scheduling. 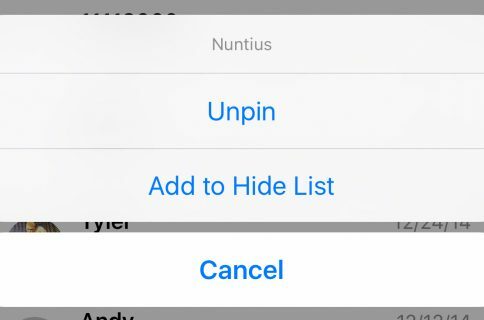 At the top of the interface, there is a button labeled Send Now that cancels the schedule and lets you send the message immediately. At the bottom of the interface, there are two buttons; one on the left and one on the right. On my iPhone 5, they are covered by the text field by what looks like a graphical user interface glitch, but they can still be tapped on. My finding is that the button on the left is a cancel button, and the button on the right is a confirm button. Tap on the button on the right, as indicated by the screenshots above, to confirm your scheduled message after you choose the correct date and time for the message you want to schedule out. 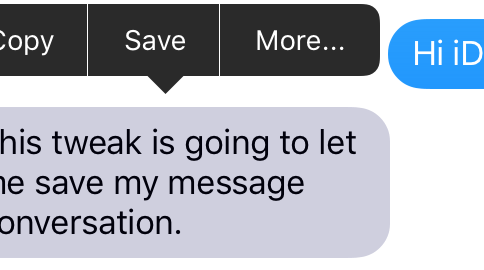 As you can see, the scheduled messages interface lets you see whether the message is an iMessage or SMS message by showing either a blue or green tab marker to the left of the message. It also shows a preview of the message, the recipient’s name, and the time it will be sent. As you can see, it was sent at 7:00 P.M. just as we designated in the Kairos UI. Kairos will add a preferences pane to the Settings app where you can configure a few options. There’s not much to do here, so there’s little to get intimidated over. 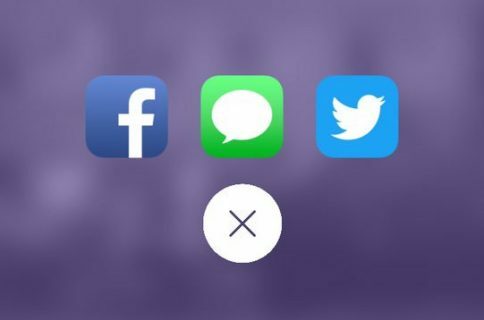 You simply enable or disable the tweak on demand, and enable or disable haptic feedback when tapping and holding on the Send button in the Messages app to schedule messages to people. Kairos is thought out well, and integrated nicely into the stock Messages app. Since biteSMS is no more and scheduling messages at specific dates and times is a feature users seem to actually need from time to time, but never actually get from Apple, Kairos a nice way to get the job done. I like that the tweak is integrated right into the Messages app without any extraneous interfaces added into a Home screen app and without any eccentric UI designs that don’t look like a native feature. Moreover, since the tweak is fairly priced at just $0.99 from Cydia’s BigBoss repository, I think it’ll be a popular sale for those who actually need or want this feature and have a jailbroken device. I really have nothing bad to say about this tweak, apart from the weird UI glitch that seemed to happen on my iPhone 5. I’m not sure if this will occur on larger-screened devices because of the additional display real estate, but since my iPhone 5 is my only jailbroken device at this point in time, that’s all the information I can give in this department. 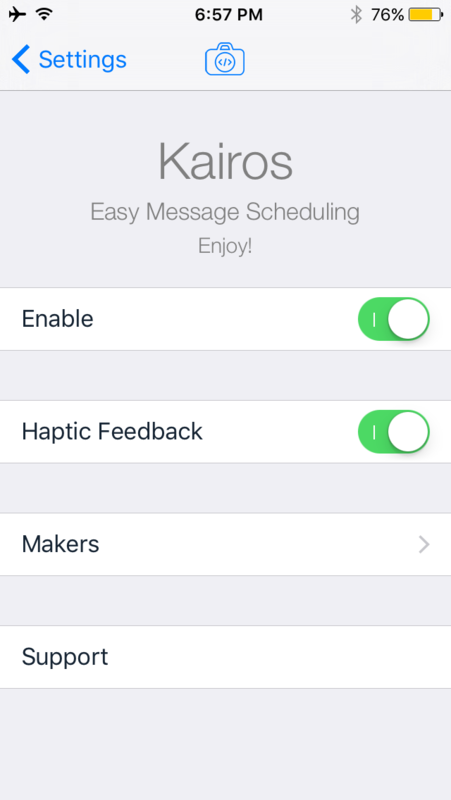 Kairos is an easy-to-use message schedule for iOS that works with both iMessage and SMS messages. You can grab it from Cydia’s BigBoss repository right now for a one-time payment of $0.99. Check it out! 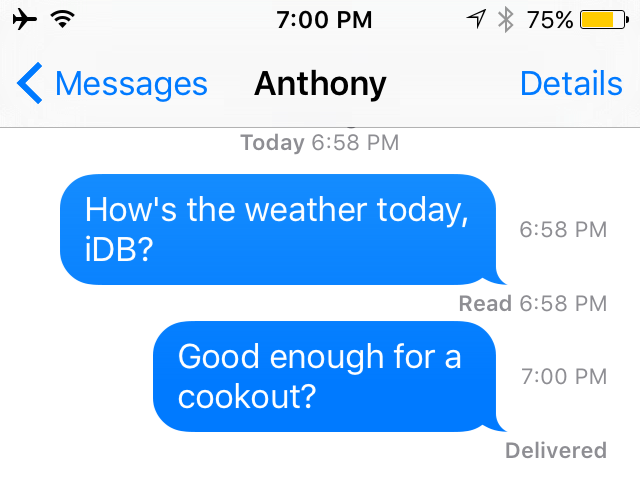 Have you ever wanted to schedule messages to people in iOS? If so, why? Share below!